When I met Alberta Parkinson, she had already done very well for 85 years. She had met and married the love of her life, raised her family and been a dozen years a widow. Her 4 little boys had grown into fine men, each creating families of their own. Over 40 years before, her mother had recognized that a mind that had been first in her class at Barnard would soon waste when the boys were no longer building cars and jet engines in the basement. She bought Bertie a loom and lessons for it for her 42nd birthday. Careful study and woven samples earned an expertise that others easily referred to, and she always extra answered any question anyone would ask…she’d give you a quick answer, then she’d copy information from her books and papers to give an even deeper understanding of what you’d want to really know. She spent years studying multi-harnessed hand looms, natural dyes, braiding, Coptic, African and pre-Columbian weavings, eventually developing her own special technique she called Intarsia (because it reminded her of inlaid tiles). 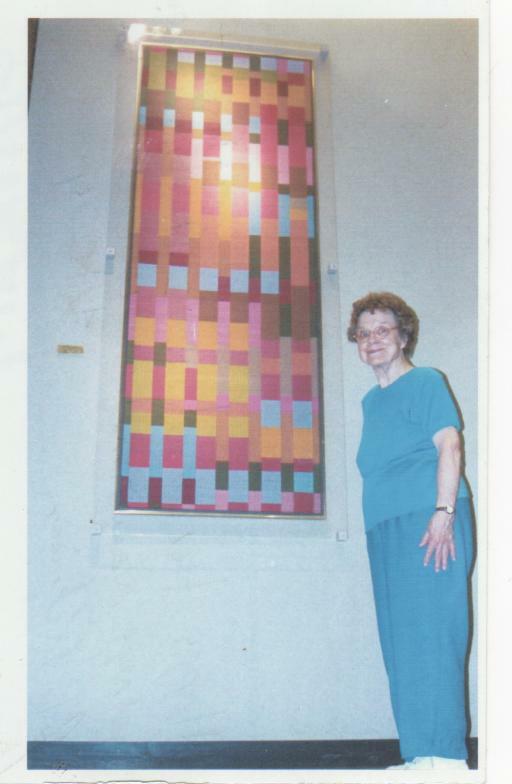 Her beloved Parky would build or modify looms to be able to do special things other weavers couldn’t even think about. She wove huge colorful pieces; some drew you in, some could throw you around, some just reminded you of something you couldn’t quite put your finger on, but she won awards whenever she entered shows or contests. I went to the Cleveland Heights library just to see her piece at the top of the stairs (they’ve moved it since they put up the bridge). I understand it now, but then, it completely confused me. Her knowledge and generosity were legendary, but by the time I joined the weavers guild, her hearing loss had progressed to the point that she no longer attended meetings. I almost missed knowing her. Luckily I wanted to learn something she was our expert in, and the other Guild elders kept telling me to “call Bertie”. Eventually I worked up the courage to call a woman I’d never met and ask her to teach me something I couldn’t quite grasp, and by the way, “I can’t really afford to pay for lessons”…Her answer was “Come have soup” I brought cupcakes for dessert, and she answered everything I asked. When she was done she started showing me other things through the house; some her work, some the work of weavers two thousand years gone. I was in a special place, and I knew it, but the exhaustion of too much took over. I think she recognized the look that happens when you’ve overfed the brain. She looked at me and said “Come back soon”, and for the next three years I came over as often as I thought wouldn’t wear out my welcome. She’s help me through projects I’d sign up for that were over my head, only letting on at the end that she would have talked me out of it had she been given proper warning. She loaned me equipment, books, fiber…courage. I’m not sure I’ve ever met a more kind and generous soul. She never had a mean word for anyone, preferring to hold a long silence. She was terribly shy while gracious and welcoming. She was no fool, and suffered none; but held a quick wit and hearty laugh. She was my teacher, but she became my friend. Now that she is gone from here, I am part of her legacy. I am honored to be so, and I thank you for letting me share it with you today.